Landing at the Curacao airport brought the realization that I wasn’t in a tropical paradise. The landscape looked like the American Southwest, covered in cactus, when I’d expected palm trees and lush rainforest. That wasn’t the last time my assumptions about Curacao proved wrong. There were many more surprises in store for me... all of them good. 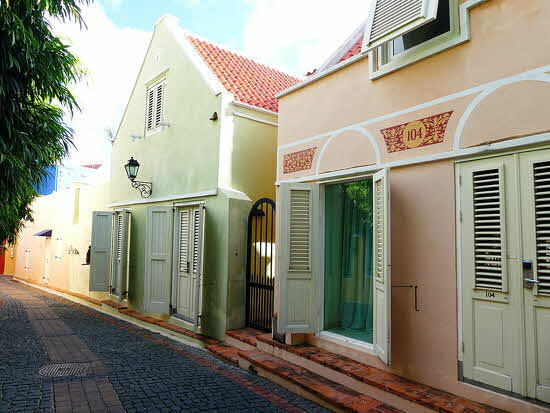 For instance, I didn’t know Willemstad, a UNESCO World Heritage city, would be so colorful and pretty. The distinctive buildings in the Handelskade area along Santa Anna Bay follow the Dutch School of Architecture, with quaint, gabled designs seen nowhere else in the world outside of the Netherlands. The additions of shutters, porches and bold colors reflect the Caribbean influence, and introduce a photogenic charm to the narrow streets of this colonial gem. This section of the city is fun to walk in, with a broad selection of the finest shops and brands, and narrow alleys that lead to hidden courtyards with shaded sidewalk cafés. There is also a round building of local shops and stalls, with a more casual flea market of pop up tents nearby. 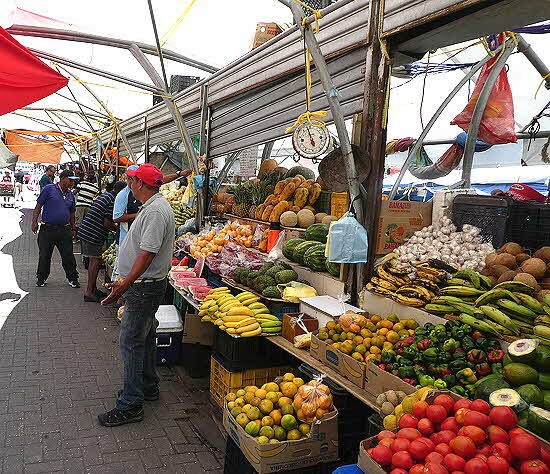 The South American coast is an 8 hour sail away, so a floating market of boats laden with exotic Venezuela produce is docked on the edge, creating a most worldly farmers market. Right near that is the pavilion dinning of Plaza Bieu, a local’s food court of good native fair. This is where to find the best goat stew, local fish and such crazy-delicious soups as cactus, iguana and okra. 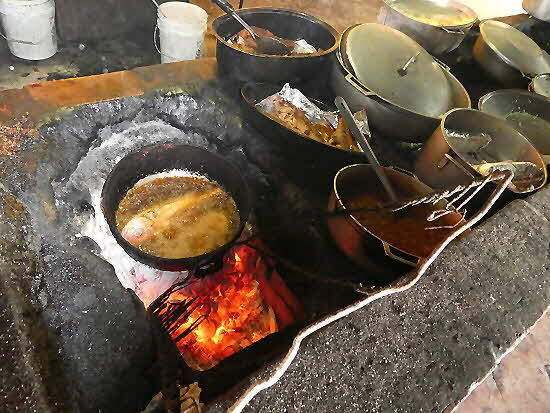 All are served from steaming cauldrons on open-pit stoves, to be enjoyed at picnic tables. You must eat here! I spent two days walking around Willemstad. It is on a very busy and very large harbor with huge ships accessing the oil refineries and dry docks further in, and the massive cruise ships moored along the docks in the city itself. 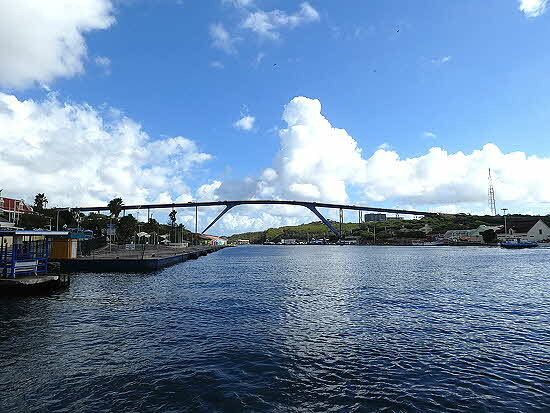 The skyline is dominated by the Queen Emma Bridge, soaring high enough above the water that the ships can pass beneath it. For walking, the pedestrian-only Pontoon Bridge connected the historic center to the opposite shore where my hotel, Sonesta Kura Hulanda was located. The Sonesta Kura Hulanda is more than just a hotel. It was an old village with the buildings creatively updated and re purposed into rooms and suites. They line the original narrow old cobbled streets that connect at a large central square featuring sidewalk dining from the hotel restaurants. Smaller squares were sculpture gardens or held one of two very pretty pools. It really is a charming place. It even has an extensive museum of slavery from the early colonial days of the island when Curacao was the center of the slave trade in the Caribbean. Much of the exhibit was collected in the village itself. Willemstad is also rich in Jewish history, customs and culture. The Mikve Israel-Emanuel Synagogue is the oldest continuously operated synagogue in the Western hemisphere. 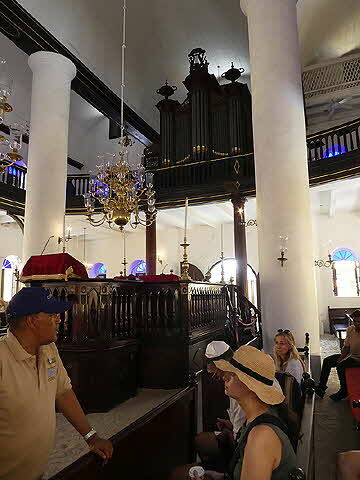 Established in 1732, almost 100 years after Jews first settled in Curacao, the synagogue’s beautiful woodwork and soaring ceiling create a historic setting for modern services. I was surprised to find that it had a sand floor which made it feel like walking on a beach. This harks back to the old world custom used to muffle the footsteps of the worshipers, when practicing Judaism was illegal and Jews were persecuted. For this information, and much more of its history, there is a museum on premises filled with artifacts - many still used in services. When visiting Willemstad you must try some of its best restaurants, many of which are located in the Williamsburg-esque neighborhood of Pietermaai, home of boutique hotels and upscale eateries. One evening there, after some very creative pre-dinner cocktails at Luke’s Bar, we walked to a restaurant named Blessing. 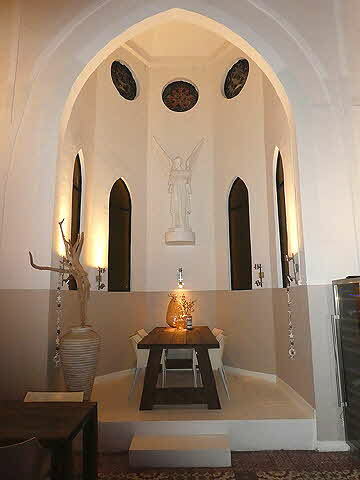 Located in an old cathedral and monastery - hence the name Blessing - they offer a refreshing take on modern cuisine. I had tuna tartar on a crunchy thin rice cake topped with aioli and shredded greens that was as pretty as it was delicious. That was followed by a medium rare rib-eye steak generously topped with mushrooms and onions. They also offered the imaginative dishes of seafood cannelloni and octopus ceviche, but it just seemed like a steak night. It was here that I saw our wine, a refreshing La Linda Viognier 2016, poured perfectly! A pet peeve of mine is that often the label of the wine is not visible when being poured. Our waitress rotated the bottle in her hand after each pouring to insure the label was visible to the individual she was serving. I rarely encounter that level of professionalism. You can expect that attention to detail from everyone at Blessing. 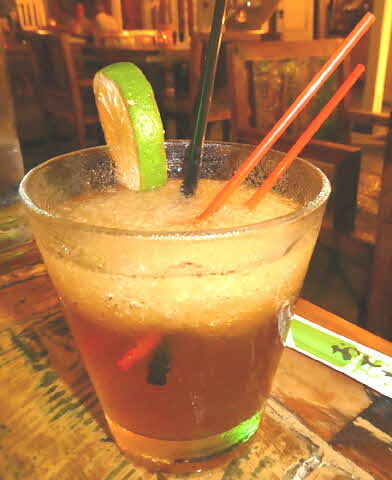 Another really fine dining experience can be had at the Asian-influenced restaurant called Ginger. There were curries and fish skewers and teriyaki appetizers, but I had back ribs with sweet and sour coleslaw. I love ribs, but only ordered them because I was sampling their Asian flavors as a main course with a combination serving of beef tikka, fish tikka, and chicken tandoori served with noodles and Indian sauce. They really know how to do Asian fusion flavors! And because pairing a wine with them all would have been impossible, I had my favorite Brazilian drink, a Caipirinha, made with cachaca, a sugarcane liquor. There were more restaurants to try than there were days, and more museums left unvisited than I had time for. In particular, there is an official Slavery Museum and a Maritime Museum worth seeing. English is widely spoken and everyone accepts the US dollar. 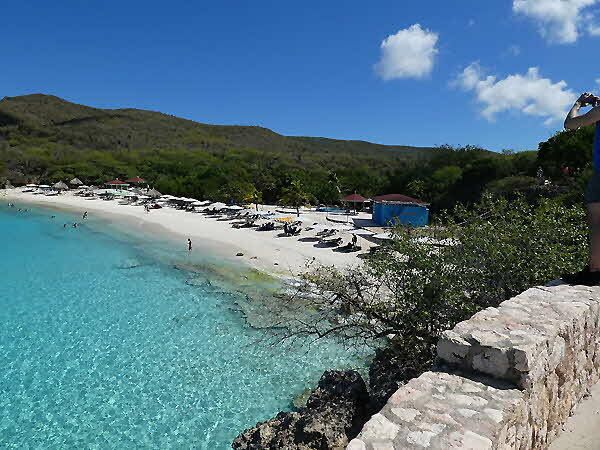 You’d be well served to spend more time touring Willemstad and learning the other neighborhoods before heading over to the west side of the island to sample some of the 35 beaches. https://outoftownblog.com/swimming-and-diving-in-curacao/ Pick one of the oceanfront resorts as a base to explore them. 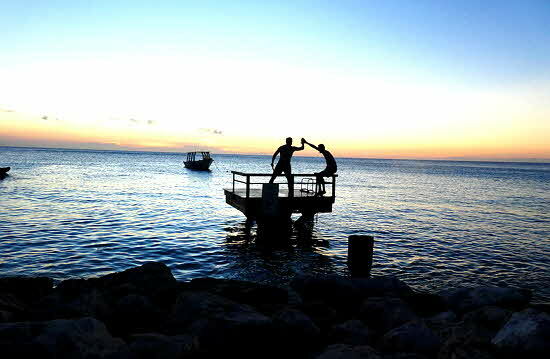 We stayed at Oasis Coral Estate Beach, Dive and Wellness Resort, with good food, swimming and unbelievable sunsets. You can rent a car at the airport.